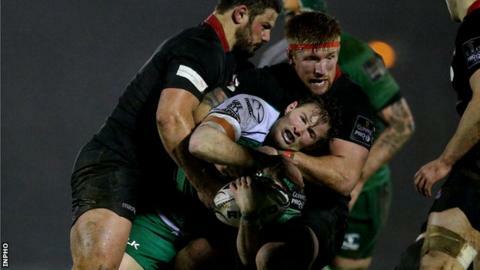 Connacht suffered their first home defeat of the season as Edinburgh proved too strong in the Pro12 mid-table game in a wet and windy Galway. Edinburgh played against a gale-force wind in the first half but took a 7-0 lead thanks to Dave Denton's try. Connacht's penalty try late in the half helped them lead 13-7 at the break but it looked a slim advantage. Two Sam Hidalgo-Clyne penalties drew Edinburgh level by the 50th minute and his 70th-minute kick sealed victory. Hidalgo-Clyne slotted his winning penalty after Connacht prop replacement Finlay Bealham had been sin-binned for a ruck infringement and Connacht's 14 men were unable to break out of their own half in the closing 10 minutes. Connacht went into the contest after last weekend's stirring win over Munster but Pat Lam's side looked jaded against the fired-up Scottish outfit. With Glasgow beating the Scarlets, Connacht remain sixth in the table as they squandered the opportunity to move above Ulster in the standings. Edinburgh's win moves them above the Scarlets in seventh spot, having earned more wins than the Welsh club. Connacht struggled to use their wind advantage in the opening half with a succession of handling errors and breakdown indiscipline hindering their efforts. Dougie Fife's run helped win the penalty which set up Denton's 16th-minute try with Greig Tonks's gamble of the quick tap paying off as the number eight barged over. After Hidalgo-Clyne added the conversion, Miah Nikora did open Connacht's account in the 24th minute but it wasn't until Ben Toolis's sin-binning in the 36th minute that the home finally managed to get some traction. The subsequent penalty following Toolis's departure saw the Edinburgh scrum disintegrating as referee Leighton Hodges awarded the penalty try. Nikora added the conversion and then slotted three more points in injury-time but the 13-7 interval lead looked scant given the conditions. Within 10 minutes of the restart, Edinburgh were on terms with Hidalgo-Clyne levelling after Ireland prop Rodney Ah You had been penalised for a scrum infringement. As the visitors continued to produce all the pressure, Connacht had a let-off when Tonks knocked on as Edinburgh looked set to maul their way over the line. However, Edinburgh did edge ahead 10 minutes from time as Hidalgo-Clyne landed another wind-assisted kick from just inside the Connacht half after Bealham's yellow card. Edinburgh controlled the remaining 10 minutes to continue their impressive start to 2015 following last weekend's win over Glasgow. Edinburgh head coach Alan Solomons: "It was certainly a tough game and conditions here were very difficult. "We won the toss and played into what was a really strong wind - it was raining as well - and I thought we really played well in that first half. "Unfortunately, we made an error and they got into our half and got a penalty try when we had a man off. "But we all felt that, with the wind, we had every prospect of winning it and I think we just had to keep calm and not let the attitude prevail that the wind's going do it for us and, of course, Sammy Clyne kicked like a dream. "We are a side who have developed over the last 17 months, all the hard work is coming to fruition and we've developed a massive amount of resilience and character." Connacht: Mils Muliaina; Darragh Leader, Robbie Henshaw, Bundee Aki, Danie Poolman; Miah Nikora, Kieran Marmion; Denis Buckley, Tom MCCartney, Rodney Ah You; Quinn Roux, Aly Muldowney; John Muldoon (capt), Willie Faloon, Eoin McKeon. Replacements: Dave Heffernan for McCartney 69 mins, Ronan Loughney for Buckley 67, Finlay Bealham for Ah You 50, Ultan Dillane for Roux 67, George Naoupu for Keon 55, John Cooney for Marmion 56, Jack Carty for Nikora 54, Dave McSharry for Muliaina 67. Edinburgh: Jack Cuthbert, Dougie Fife, Matt Scott, Phil Burleigh, Tim Visser, Greig Tonks, Sam Hidalgo-Clyne; Alasdair Dickinson, Ross Ford (capt), WP Nel, Anton Bresler, Ben Toolis, Roddy Grant, Hamish Watson, David Denton. Replacements: Neil Cochrane for Ford 62, Fraser McKenzie for Bresler 76. Not used: Rory Sutherland, John Andress, Tomas Leonardi, Sean Kennedy, Jade Te Rure, Andries Strauss.